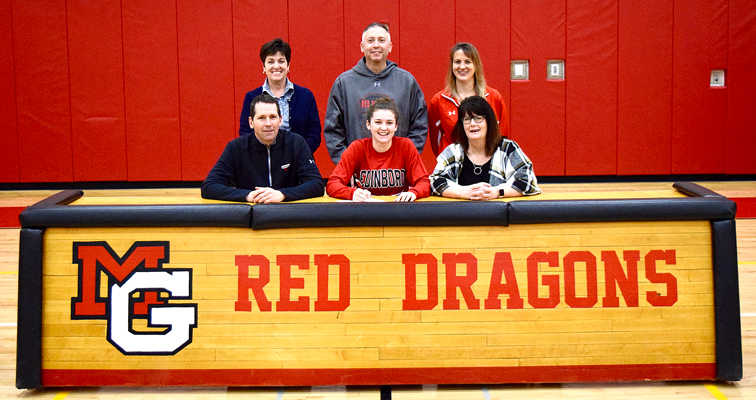 Maple Grove senior Clare Crossley, pictured in front center, signed a national letter of intent to play soccer at NCAA Division II Edinboro University on Thursday. Crossley, the 2016 and 2018 Post-Journal Girls Soccer Player of the Year, scored 100 goals to go along with 65 assists during her career. She is pictured with her father, Ken, and mother, Ann. In back are Julie Verdonik, Maple Grove Junior-Senior High School principal; Mike Burr, Maple Grove varsity girls soccer coach; and Kathy Burnett, Maple Grove athletic director.